Though far from an exhaustive list of the residences in Salem with architectural importance, this section of the Website includes examples of houses from the seventeenth, eighteenth, and nineteenth century, some of which have particular importance for Hawthorne. Others are important examples of architectural styles in Salem and offer a sense of Hawthorne's world. Pickering House, 18 Broad St. at Pickering St. Built around 1651, this is Salem's oldest building in Salem and was continuously occupied by the Pickering family from 1651 until the late 20th century. The wooden structure was intially built with two rooms in two stories, but later was expanded to double this size, and changes were made in the mid-nineteenth century which reflect the Gothic Revival Style such as the Gothic cut-out fence with finial-capped posts which was constructed in 1841. On July 4, 1804, the day of Hawthorne's birth, John Pickering, the son of Timothy Pickering, gave the Independence Day oration at St. Peter's Church. This house, built in 1655 for John Becket, the great-great grandfather of Retire Becket, a member of the famous Salem shipbuilding family, was originally located on Becket Street, next to the family shipyard. Originally the house consisted of a large living room on the first floor and a bedroom on the second. The house was later enlarged, perhaps when Becket's son married, and in 1682, a leanto was attached to the rear. The house passed down to Retire Beckett and then to two of his sisters, one of whom sold her half to the Eastern Marine Railway Company in 1850. The Railway Company razed this portion of the building and the chimney. In 1916 Caroline O. Emmerton, founder of the House of the Seven Gables Settlement Association, purchased this house, and in 1924 it was moved to its present site. Currently it houses the gift shop of The House of the Seven Gables Historic Site. The building that stands today is only half of the house owned by Retire Becket as one of the Becket sisters who inherited the house after her brother, Retire, died, sold her share to the Eastern Marine Railway Company who demolished it. An archway and leanto were added by Ms. Emmerton. Peabody House (aka Grimshawe House), 53 Charter St.
Dr. Nathaniel Peabody, a dentist, bought this house in 1835 lived and lived there with his wife and daughter Sophia in 1837 when Hawthorne and his sisters first came to call on Sophia and her sisters, Elizabeth and Mary. It is also the house in which Grimshawe and his wards, Ned and Elsie reside in "Grimshawe" and where Dr. Dolliver and Pansie reside in the "The Dolliver Romance." Both are unfinished works of Hawthorne's last years. The house, built in 1673 by Bethiah Pickman, is currently owned by Dr. Berkley Peabody, a distant cousin of Sophia, and his wife, Joanna. Dr. Peabody is professor emeritus from SUNY, Albany and frequently gives lectures on Hawthorne in Salem. Jonathan Corwin house, 310 ½ Essex St. at North St.
Jonathan Corwin, a Salem merchant, purchased the house from Nathaniel Davenport of Boston in 1675. Davenport had never finished the construction of the house, so Corwin had the work completed. Corwin was living here in 1692 when he and John Hathorne served as the magistrates of Salem Town, issuing warrants for the arrest of those accused of witchcraft, and on the Court of Oyer and Terminer that sentenced accused witches to death. There is a tradition that some of the accused "witches" of the Salem hysteria were examined in the lower front room on the right, and today the house is known as the "Witch House." The house was unfinished when Corwin purchased it, but when completed, it had a central chimney plan, projecting two story front central porch, peaked gables, and a rear lean-to. Around 1746 Sarah Corwin, the widow of Jonathan Corwin's grandson, George, enlarged and remodeled the house in the Georgian Colonial style. The house was further altered between 1856 and 1885 when George P. Farrington, the owner, added a drugstore to the front. In 1945 Historic Salem purchased the property, saving it from being demolished, and had it restored. Constructed in 1680, the Narbonne House is now owned by the Salem Maritime National Historic Site. The exact date of construction of this house is unknown, but it was before 1681. The house was owned at this time by Samuel Pickman, a mariner. The house, restored in 1969, was a museum for a period after that, but today it houses offices. Hooper-Hathaway House, 23 Washington St. in Hawthorne's time; now located on the property of the House of the Seven Gables Historic Site on Turner St. This house was built in 1682 for Benjamin Hooper, a cordwainer. It began as a single-room plan but was expanded in 1784 and in later years. The Hoopers sold the house to Henry Rust in 1795, who in turn sold it to the Gardner family. Around 1864, it was purchased by the Hathaways, who ran a bakery from the property. In 1911 the house was in danger of demolition, so Miss Caroline O. Emmerton purchased it and had it moved to the grounds of the House of the Seven Gables where it was restored and where it stands today. Philip English House, English St., near Collins Cove Built in 1683 at the head of what is now English St., not far from Collins Cove, this house of many gables was thought by some to be the location of the house of Hawthorne's novel. Called "The Great House," it was considered the most lavish home in Salem of that time. Philip and his wife, Mary, lived here in 1692 when they were accused of witchcraft. Initially imprisoned in the Cart and Wheel Inn in Salem, they were moved to Boston in June and placed under house arrest after the intervention of friends. Allowed their freedom during the day in Boston because of their upper-class status, they fled on a ship to New York in August before their trial in Salem. A secret garret room that was discovered when the house was razed may have been built after Philip and Mary returned to Salem as a hiding place should it ever be needed. John Ward House 38 St. Peter St. Originally at 38 St. Peter St. in Salem, the Ward house was acquired by the Essex Institute in 1910 and moved to its present site on the grounds of the Peabody Essex Museum. Built in 1684 by John Ward, it originally had a one-room plan and a projecting second story with a cross gable. By 1732 it had doubled in size and acquired two matching cross gables in front and a lean-to attached on the rear. It is generally regarded as one of New England's finest wood-frame-and-clapboard dwellings and is open to the public. Visitors see George Francis Dow's interpretation of First Period New England architecture, arts, and domestic life. Dow, an historian and preservationist, was the first to conceive of period rooms for museums and the first to use costumed guides at historic sites. Crowninshield-Bentley House, 126 Essex St. Built in 1727-30 for sea captain and fish merchant John Crowninshield, this house was enlarged in 1761 and 1794. In 1959-60, the house was moved to its present location across from the Hawthorne Hotel, and modern additions, which had appeared over the years, were removed to restore the house to its eighteenth century appearance. This house is considered perhaps the finest example of Georgian Colonial architecture in Salem and is currently open to the public and maintained by the Peabody Essex Museum. It is noted for its symmetrical front elevation with reconstructed front and central doorway flanked by flat Doric pilasters. From 1791-1818, Reverend Willliam Bentley, minister of East Church in Salem, was a boarder here. While living here, he wrote a large portion of his famous diaries, considered among the best sources of information about Salem life in this period. His diaries were published by the Essex Institute in 1900. Elias H. Derby (1739-1799), a prosperous merchant of the eighteenth century, grew up in this house built for his father, Richard (1739 1799), a successful sea captain and ship owner, in 1738. The Wards purchased this house from the Derbys after the Revolutionary War and occupied the house well into the nineteenth century, but ownership after that is uncertain. In the Custom House chapter of The Scarlet Letter Hawthorne refers to E.H. Derby as "King Derby." Derby House, 168 Derby St. on the grounds of the Salem Maritime National Historic Site. 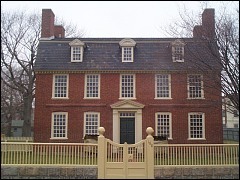 Built by Captain Richard Derby for his son, the prosperous merchant Elias Hasket Derby, in 1761-2 on the occasion of his marriage to Elizabeth Crowninshield, this is the oldest surviving brick house in Salem. It was later occupied by the Nichols, Prince, and Ropes families, other important Salem merchants. A fine example of Georgian Colonial architecture, it has fine brick detailing and a Tuscan Doric classical doorway with triangular pediment. In 1790 a kitchen ell was added. After falling into disrepair in the late nineteenth and early twentieth century, the house was purchased by the Society for the Preservation of New England Antiquities and restored. Further restorations have been completed by the National Park Service which has operated the property since 1938. House of Charles Osgood, 13-15, Central St. Built in 1766, possibly for Joseph Scott, this wooden house next to the Essex Bank on Central Street, was later owned by Charles Osgood, who painted what is probably the most famous portrait of Hawthorne. The house was renovated in the 1970s during Salem's urban renewal. This Federalist house, located between the Custom House and the Richard Derby house, was built in 1780 for Elias Hasket Derby but left unfinished as Derby decided instead to purchase the Pickman house on Washington St. The house was not completed until 1801 when it was purchased by Benjamin Hawkes, a boatbuilder, who produced the house that still stands today. The Hawkes house was restored in 1938-39 and again in 1959. Today it contains the offices of the Salem Maritime National Historic Site. Peirce-Nichols House, 80 Federal St. This elegant house, built c. 1782, is one of the most outstanding examples of Federalist wooden residences in America. The house was first owned by Jerathmiel Peirce, a leather-dresser who became a prosperous merchant and who developed with Aaron Waitt one of the largest India trading companies in the U.S. When Peirce's daughter, Sally, married George Nichols in 1801, the house was remodeled in McIntire's later Adamesque style but it retains details of his Georgian style as well. The house was transferred to the ownership of George S. Johonnot in 1827, but in 1840 George Nichols inherited the house, and it remained in the Nichols family until 1917 when the Essex Institute purchased it. Joshua Ward House, 148 Washington St. Constructed between 1784 and 1788, this house still possesses most of its original features and is Salem's oldest Federal high-style brick house. During the nineteenth century the house was referred to as the Washington Hotel as President George Washington stayed there one night in 1789. The house has been significantly altered from the original, believed to have been designed by Samuel McIntire around 1790 and purchased in the process of its construction by Simon Forrester, a prosperous merchant, in 1791. The house is located next door to the Custom House and was convenient to the Central Wharf. Significant alterations have been made in the house since World War I resulting the removal of many of its original architectural details.
. Forrester became wealthy during the Revolutionary War, but his reputation is tainted by stories of his alcoholism. Joseph Felt House, 113 Federal St. This house was constructed in 1794-5 for Joseph Felt and occupied by the Felt family for many years. In The Salem World of Nathaniel Hawthorne, Margaret B. Moore discusses Joseph Barlow Felt's and Bentley's different views on the presence of Indians in the Salem area and the theory that links the witchcraft hysteria of 1692 to the fear of Indians. The date of construction of this house is uncertain, but it may have been built before 1800 and thus be the oldest house on Chestnut Street. Chestnut Street was created in 1796, but the house could have been built before this with access from Essex St. The house was originally owned by James B. Bott, owner of a saddle shop. Hawthorne lived here briefly in 1846-47 while working at the Salem Custom House. In 1888 Augustus J. and Benjamin H. Fabens purchased the house and moved the main entrance from the west side to the south end of the house. Cook-Oliver House, 142 Federal St. Built in 1802-3 for Captain Samuel Cook, this masterpiece of early nineteenth century architecture is an important and innovative example of Adamesque Federal wooden homes. It is an undisputed example of Samuel McIntire's (1757-1811) work. A three-story residence, it features a low hip roof, molded window frames, a second story horizontal belt course. The central entrance features sidelights and a semi-elliptical fanlight; the doorway is decorated with Doric columns. The house is behind McIntire's finest surviving wooden fence which is adorned with details similar to those on the entrance. Cook's son-in-law, Henry K. Oliver, Hawthorne's contemporary who later became mayor of Salem, lived here with his family and composed the hymn "Federal Street" here. Built in 1810-12, this large Federal brick mansion was built for Benjamin W. Crowninshield, a member of a merchant family, and a U.S. congressman and secretary of the navy under Presidents James Madison and James Monroe. Monroe stayed here in 1817 while visiting Salem, and General James Miller lived here while serving as collector at the Custom House from 1825-29. Miller is one of the Custom House employees referred to by Hawthorne in the Custom House sketch. In 1906 and 1916, this house was expanded considerably. Today this house is a home for aged women, a purpose it has served since 1861, as noted in the inscription on a panel in the front wall between the second and third stories. Gardner-Pingree House, 128 Essex St.
Salem merchant John Gardner, Jr., built the house in 1804-5, and in 1811, because of financial difficulties, sold the house to Nathaniel West who sold the house three years later to Joseph White. It is here where Captain Joseph White lived and was murdered in April 1830, an event that shook the town of Salem and one which intrigued Hawthorne. Some scholars see the influence of this trial on The House of the Seven Gables, and some also believe it influenced "Mr. Higginbotham's Catastrophe." In 1834, the house was sold to David Pingree, and the ownership of the house remained in the Pingree family until 1933 when it was donated by the Pingree heirs to the Essex Institute. With its lovely details and proportions, this dwelling is considered to be a superb example of American Adamesque Federal town houses and perhaps the best example in New England. Many scholars believe the house was designed by Samuel McIntire and consider it to be his finest mature work. Details consistent with McIntire's work are the symmetrical rectangular façade wooden roof balustrade and an elaborate semicircular portico entrance with Corinthian columns and pilasters. Built in 1806-1807 as a residence for Captain Joseph Waters, this building now serves as the office for the House of the Seven Gables Settlement Association. This photograph was taken in 1891 by Frank Cousins. After 1929 the house was changed significantly. This brick Federal home with Greek Revival front entrance was built c. 1808-1809 for a Salem merchant, Nathan Robinson. Robinson lived in the house until the mid 1830s, after which the Choates, Neals, and Fabens families occupied the house. This Federal residence was built in 1818-19 for John Forrester, son of the merchant, Simon Forrester. Forrester and his family occupied the house until 1834 when it was purchased by Col. George Peabody who added the one-story ballroom wing and the three-story bay in the large north ell. Later the building housed the Salem Club, a men's social club, and the Bertram Home for Aged Men. Captain John Bertram, who became wealthy through maritime trade and the railroads and was one of Salem's chief benefactors, funded the Home for Aged Men. John Tucker Daland house, 132 Essex St. This house was built in 1851-2 for John Tucker Daland, a wealthy merchant. Daland and his family occupied the house until 1885 when the Essex Institute acquired it as a permanent home. Currently the Daland House is part of the Phillips Library.